Every six weeks or so, we (BayLUG) change out our display window at the Valley Fair Mall LEGO store. This time, we replaced the Hollywood diorama with a haunted house in honor of Halloween. It will be on display there through November. 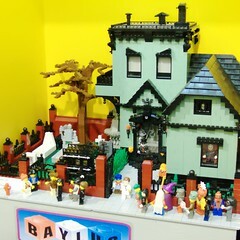 The entire display is the brainchild of Kenny Paul, a member of BayLUG and designer of excellent houses and other buildings. Check the photos for all the great little details he’s included. My favorite part is the way two of the windows look like angry eyes glaring out at the street. It reminds me of that otherwise forgettable movie Monster House from a few years back. Click the photo to see all the pictures on Flickr or view them as a slideshow. This past Saturday, we installed a new display into the “Window on the Community” display at the LEGO store in Valley Fair Mall (Santa Clara, CA). This time, we featured the work of one of our younger members. CJ has been providing our layout with an impressive diorama of a Hollywood studio for the past few train shows, including the NMRA national convention in Anaheim last month. This display is taken from that diorama, and features a building façade with a car bursting out of it, and a film crew capturing the action. In the train shows, there’s a motor moving the car in and out, to show that it’s teetering on the edge of falling, but we didn’t have the ability to power the display at the LEGO store. Click on the image to view the images on Flickr, or see the slideshow. 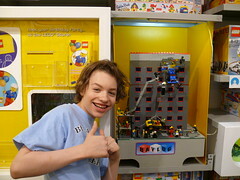 Last Saturday, we changed out the display at the LEGO store in Santa Clara. 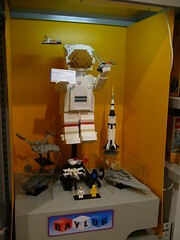 The Bay Area LEGO Users’ Group installed a new display at the Valley Fair Mall in Santa Clara, CA featuring a large spaceman model and various nanoscale spaceships by Charles and Adrienne, and a rocket-powered knight by Bruce. This replaces my Blackburn Hotel that had been on display since May 31. Click the big picture to go to the set page on Flickr, or you can view a slideshow of the photos. From May 31 to July 5, my Blackburn Hotel (Version 2) was on display at the LEGO Store at Valley Fair Mall in Santa Clara, CA in the BayLUG window. 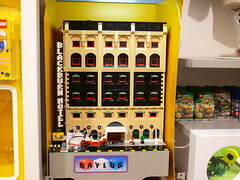 This is a redesigned, bigger model of the mythical Blackburn Hotel that I originally built for the Bay Area LEGO Train Club layout. I haven’t done a proper photo-shoot of the hotel itself, but you can see pictures of it in a Flickr set I created to collect all the images of it, including the ones from this store display. For the store display, however, I had to customize it a bit. I left off the rooftop sign, and modified the baseplates. The version that was used in BayLTC train shows used regular road plates for the street, rather than the tiled half-road (16-stud-wide baseplates) seen in the store display. Also, because the left side of the hotel was located on a street corner, the model didn’t include the road there, while on the right side there was an 8-stud half-alley. When we installed the hotel at the store, that caused the sign to be pressed against the background side wall, and the right side to have a strange gap. So, we ripped the baseplates off the bottom of the hotel and moved everything over by eight studs, putting in a partial road on the left side. Thanks to Russell and Bruce for their help reconfiguring the baseplates.